Stingrays are numerous and found on the beautiful sandy patches that are scattered between the bommies. Even the odd Dugong has been spotted feeding on the sea grasses. Birds are also plentiful because of the islands and cays around. 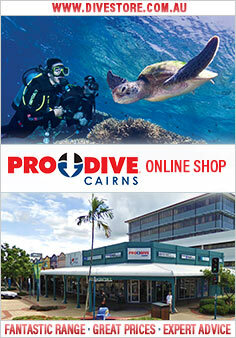 These sites are recommended for easygoing casual dives. Most operators offer two dives with time for snorkelling in the middle while others can even offer three dives. There is also a half-day tour to an island if you are after a really quick trip. Some are more gentle gardens where beautiful Butterflies, Angels, Parrots and Wrasse get on with their daily activities. Some include huge Clown Fish cities, which have left many a diver motionless as they suspend and watch undoubtedly the biggest colonies of Clown Fish that they have ever come across, (one of those great places for underwater photography). Many sites have large walls where huge schools of pelagics cruise by effortlessly. On a three day extended tour you can usually log around 11 dives and each site visited will be unique and totally different from the last. These reefs are also ideal for night diving, as experienced divers will tell you a site looks totally different at night. These sites are recommended not just for the experienced diver who is looking for diversity and maximum dives in short time but also for the newly experienced diver who is looking to get some excellent diving still in a very safe environment. The Far Northern Reefs take in the Ribbon Reef system, a series of reefs stretching out like a long multi-coloured ribbon to the north to reach the famous Cod Hole, where a large family of Potato Cod live, as well as huge schools of fish and Maori Wrasse who all compete for a free fish dinner. The Ribbon Reefs themselves offer stunning dive sites that have an extremely varied amount of coral and marine life on them. These range from giant clams up to 2 metres across, with beautiful hard corals and coral associated fish. Join the Big Eye Trevally and Barracuda as they school around, watch Mackerel hunt juvenile Fusiliers gathered in schools against a magnificent backdrop of plate corals. Blend with the Baitfish and search out the Rays as you drift along the walls. Towering Pinnacles covered with beautiful corals and clouds of aquarium fish. Look out on these reefs, as a highlight would always be spotting the graceful Manta Rays. Night dives feature dives with sleeping green turtles and a variety of sleeping reef fish. Experienced divers expect wall diving, drift diving and the chance to photograph some of the most spectacular sights imaginable. 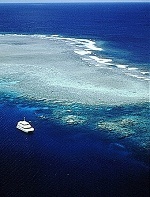 A trip to these reefs are usually around 4 to 5 days in length, with a 7-day trip available too. Some trips include a low level flight one way so less time is spent steaming and more time under the water. "Experienced Diver Heaven". Hop onboard your vessel and get ready for a long steam crossing open ocean (usually at night). If you arrive to perfect conditions the Coral Sea can offer 1000metre (3000ft) vertical walls with 40metre (120+ft) visibility. Here you can spot sharks including Grey Whalers, White Tips, Silver Tip Whalers, and circling scalloped hammerheads in July. Schools of Barracuda and large Dogtooth tuna are also always nearby. Night divers may expect to see rare Flashlight Fish as they swim in and out of crevasses. The Coral Sea is not for the faint hearted and not for those who may be prone to seasickness. The dives are usually deep and can quite often have roaring currents. Trips are usually 5 days in length and incorporate the Ribbon reefs as well. Best months for the Coral Sea are late September through to December.